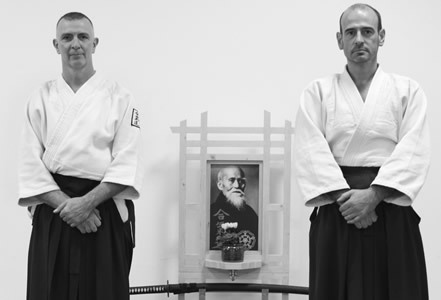 Prince Bishops Aikido – Traditional martial arts and self-defense in Durham, North East England. Here at Prince Bishops Aikido, which includes Durham University Aikido Club, we teach a practical and dynamic approach to aikido whilst maintaining the traditional principles, which make aikido a unique martial art. Based in Durham City, we have four weekly classes as well as occasional full day training sessions and regular trips to train with our parent association – White Rose Aikikai. We teach traditional aikido self-defense techniques and exercises in a variety of ways, from classical empty-hand attacks to exercises with weapons. The weapons we use are the katana (samurai sword) or bokken (wooden version), jo (4ft staff) and tanto (knife). Though the sword and jo are not the preferred weapon of attackers these days they can be related to a club, bat or bottle; the methods are exactly the same. The weapons exercise also lead to a greater understanding of empty-hand techniques also. All are welcome to join us. Your first class is free and you can pop along to watch anytime too, to see what we do and if it’s for you.